I know, for most of us gluten free doesn’t exactly spell delicious. But these pancakes are heavenly. I am not a liar, at least I am fairly sure of that, and honestly these pancakes are spicy, soft, tender and not one iota grainy which some gluten free products can be infamous for. This batch happened to have chocolate chips as well. We live big around here. Our house is full of gluten sensitive peeps. And on any given day, I am throwing together a batch of gluten free pancakes, pumpkin waffles (yes, recipe coming soon) and to-die-for chocolate chip cookies. So I have gotten these babies down and have tweaked the recipe a few times to come up with these dependable and delectable cinnamon apple pancakes. 1. Have your favorite GF flour mixture made ahead in large batches and stored in an air tight large bowl (Tupperware has some ginormous ones that make my life a dream). 2. Use EXTRA FINELY Ground Brown Rice Flour in any recipe that calls for Brown Rice Flour. The extra finely ground makes an immensely HUGE difference in texture. Presto change-o no grainy texture! 3. Always aerate the flour mixture beforehand by shaking it like a Polaroid picture. 😉 Just double check to make sure the lid is securely on. I have had more than a few mishaps with flour splattered all over my face and clothes. 4. Never ever pack your flour when measuring. Always spoon it into the measuring cup. Very, very important with GF flour. Some people swear by weighing it, but many recipes I start from don’t use weight as their measurement. 5. Add flavor. My basic GF pancakes are fine but not memorable. Once I began adding things like apple sauce or pumpkin puree, my pancakes rose to stardom. Add spices, extracts, whatever flavor profile you are going for. 6. Beat it; don’t worry about over mixing. We are so ingrained to not over-mix our batters because gluten forms and our product gets tougher, however, with GF baking, the beating and mixing vigorously really helps to get rid of the grittiness (in most recipes…not all) and after all, no gluten could be forming anyway. Makes about 10 medium pancakes. 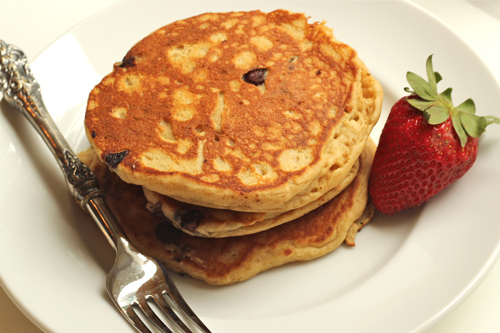 *I have not used a purchased GF flour blend to experiment with these pancakes, but if you do, PLEASE COMMENT and let us know how it goes. I would like to make it as simple as possible for my readers, but I only know what I have done and what has worked for me. To make the pancakes: First and foremost grease your griddle pan and begin heating it on a medium to medium-high heat depending on how hot your burners get. You need a nice hot griddle to make really good and well cooked pancakes. I turn mine down to low once it has gotten hot. You don’t want to burn your butter. Put a pat (about a table spoon) of butter in your pan; I need to use two pats because I have a large griddle which spans two burners…so if that’s the case for you then put one pat towards each end. I also put one capful of Canola oil over the butter pat(s). I turn my griddle on medium and as it melts, I spread it around with either a wooden spoon or if I am being totally honest here, I usually use a paper towel and do it quickly so as not to get burned nor start I fire. I highly discourage both. The paper towel, though, will help to soak up some of the excess grease so your pancakes aren’t too greasy. Now get out your pre-made GF flour blend (go to my GF tab to find the recipe) that is stored in an AIRTIGHT (with lid tightly closed) container. Shake it like there is no tomorrow. Have fun with it and get out a little aggression. To measure your flour, spoon the flour into a one cup measuring cup and then level off with a knife and put it in a large mixing bowl. Add the milk powder through the salt and whisk thoroughly, getting out any clumps of brown sugar. In a large liquid measuring cup or medium-sized mixing bowl, put in the apple sauce through the vanilla and beat well with a wire whisk. Beating it very well helps to make sure your pancakes come out smooth and tender, eliminating that graininess that some GF foods can be infamous for. Add the liquid to the dry ingredients and beat again for several seconds until you have a smooth batter. Add the chopped Granny Smith and stir in with a rubber spatula. Turn you griddle back to medium now that you are ready and wait a minute or so for it to get hotter again. Ladle pancake batter onto the griddle and cook until you see bubbles forming in the batter on the pancake. You can always use your spatula to peek underneath a little sooner to check on them so they don’t burn. When ready, flip and cook another 1-2 minutes, or until pancakes seem mildly firm to the touch. 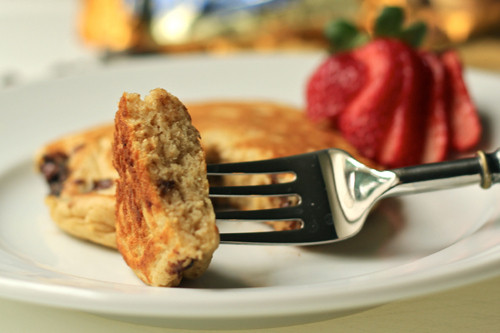 Don’t flatten your pancakes by pushing down on them with the spatula. That is a big no, no for fluffy pancakes. Alton Brown once said this and I have never forgotten it and swear by this fact. Categories: Breakfast, Gluten Free | Tags: Annalise Roberts flour blend, gluten free apple cinnamon pancakes, gluten-free baking classics, gluten-free baking tips, gluten-free pancakes | Permalink. Just great pictures that is the hardest job to achieve in posts ,really difficult to get good food pics, great job. I’ll let my husband take that compliment. He shot these and you are so right. Very, very difficult to get good lighting, crisp shots and make the food look as good as it really is. You are very nice to take the time to comment. I live with the Chef l mentioned and so often we see a really poor picture and look at the recipe and it sounds great, try it and it tastes great! Though if you went by the pictures ,you may never try the recipe’s, tell him to keep up the good work. Those pancakes look so soft and fluffy! Look forward to your pumpkin waffles recipe. Hi Geni, I’d never guess these were gf looking at the pics! I think you definitely have this gf baking down pat!! You know I love anything pumpkin! I’d gladly eat these! They look delicious!! P.S I recently lost 1000 subscribers on my blog and I have no idea how so if you could resubscribe if you were subscribed, I would really appreciate it! Hope the problem is fixed if it can be! Thanks CCU…i will look into if I am still subscribed to you.